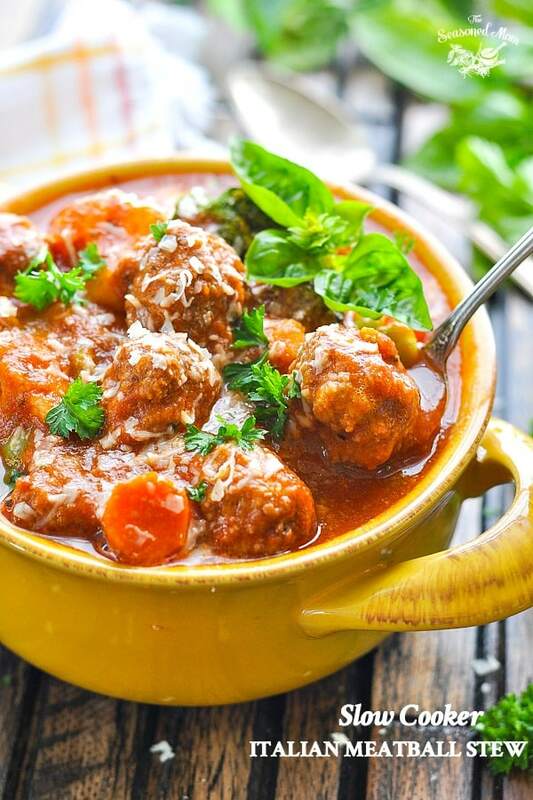 This healthy and easy Slow Cooker Italian Meatball Stew will please every member of your family! 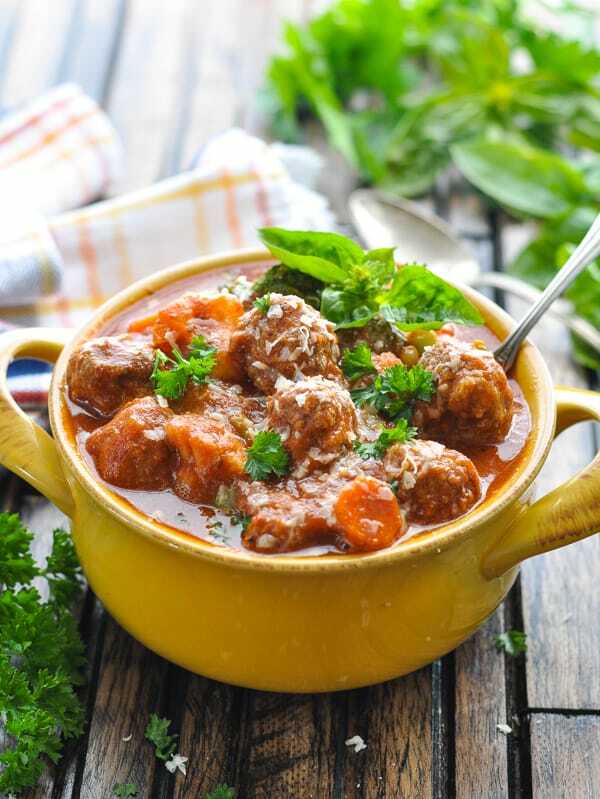 This healthy Slow Cooker Italian Meatball Stew will please every member of your family! It’s an easy comfort food dinner that is perfect for a cool, fall evening. 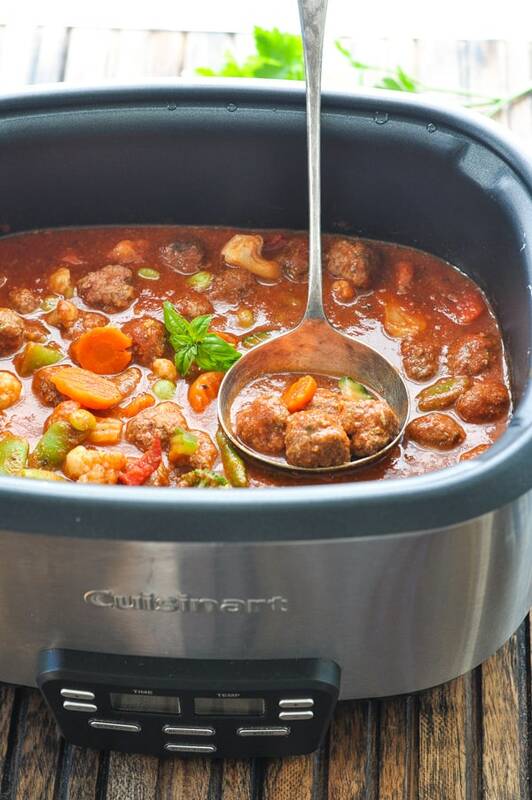 Moms love the Crock Pot, while kids adore the little meatballs throughout this hearty, nourishing dish. This is one of those perfect meals that everyone raves about around your dinner table, and that your husband will even enjoy for leftovers the next day! The old fashioned Italian meatballs cook right in the Crock Pot, so there’s no need to brown them in an oven or skillet first. And who doesn’t love a homemade meatball that has been simmering in a rich Italian sauce for hours? This recipe just works! 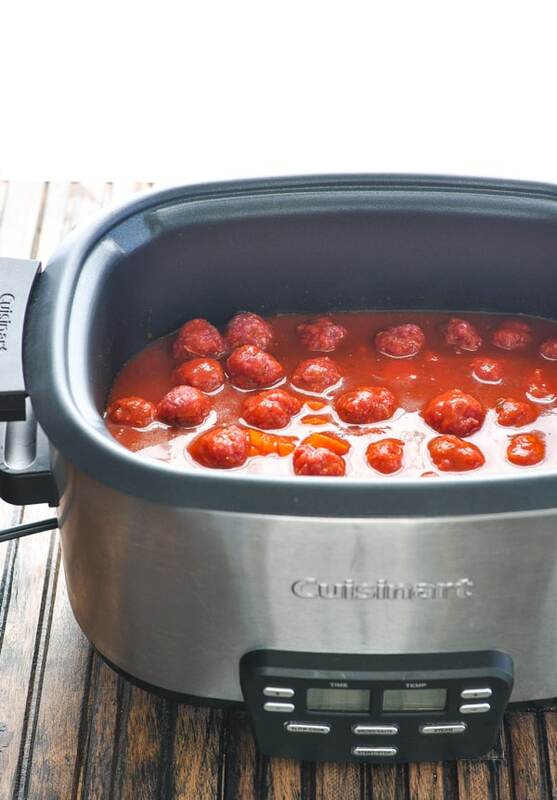 How do you make Italian meatballs in the slow cooker? First, peel and slice 2 large carrots. Place them in the bottom of the slow cooker. Now it’s time for the Italian meatball recipe! These authentic Italian meatballs are made with extra lean ground beef, Italian style bread crumbs, egg, Parmesan, milk, and seasoning. Use your hands or a fork to gently combine the beef mixture, being careful not to over-mix (that will result in a tough, dry meatball). Then roll the meat into small, 1-inch balls. I use this small scoop to make the task very quick and easy! Place the meatballs on top of the carrots in the Crock Pot. and then pour it over top. Cover the slow cooker and cook the meatballs on LOW for about 4 hours or on HIGH for about 2 hours. When the meatballs are cooked through, microwave a bag of Italian vegetables just until crisp-tender. Pour the vegetables into your stew, and the meal is ready to serve! I prefer to add these vegetables at the very end because I can control how soft the vegetables get. If you add them to the slow cooker at the very beginning, the veggies will be mushy by the time the meat is cooked — and nobody wants overcooked vegetables! This thick stew is perfect on its own, or when served over pasta or rice. For a thinner, soup-like consistency, stir in additional broth at the end until it reaches the desired consistency. Garnish with fresh herbs and grated Parmesan for a meal that your family can’t resist! This recipe yields 6 cups of stew, which serves 3-4 people. If you’re feeding a larger family, I recommend doubling all of the ingredients. The cooking instructions remain the same. I used the Italian vegetables here, which include broccoli, cauliflower, zucchini, carrots and red bell pepper. You can substitute with an equal amount of any frozen vegetables that you prefer! I steam the vegetables in the microwave before adding them to the meatball stew. 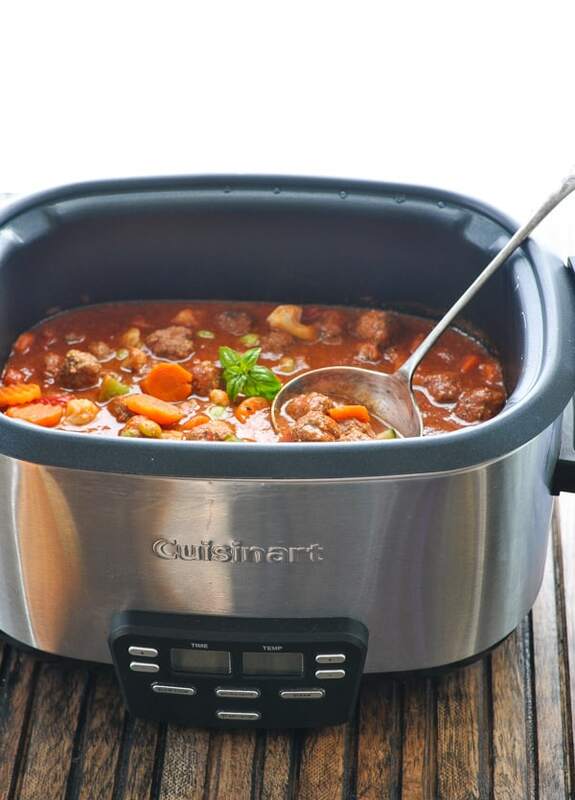 This allows me to control the tenderness of the vegetables and prevents overcooked, mushy veggies. You can substitute ground turkey or ground chicken in place of the beef. Just make sure that whatever meat you use is at least 96% lean, since you will not be draining the meat after it’s cooked. You don’t want any extra grease in your stew. 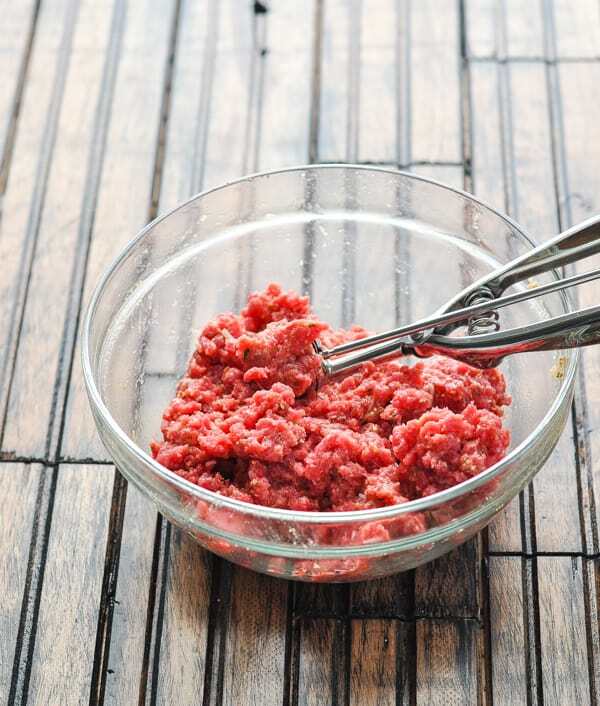 Use your hands or a fork to gently combine the beef mixture, being careful not to over-mix (that will result in a tough, dry meatball). This is a thick stew with minimal broth. If you want a thinner consistency so that it’s more like a soup, just add extra beef broth at the end. I serve my kids’ stew over pasta or rice, which they love. 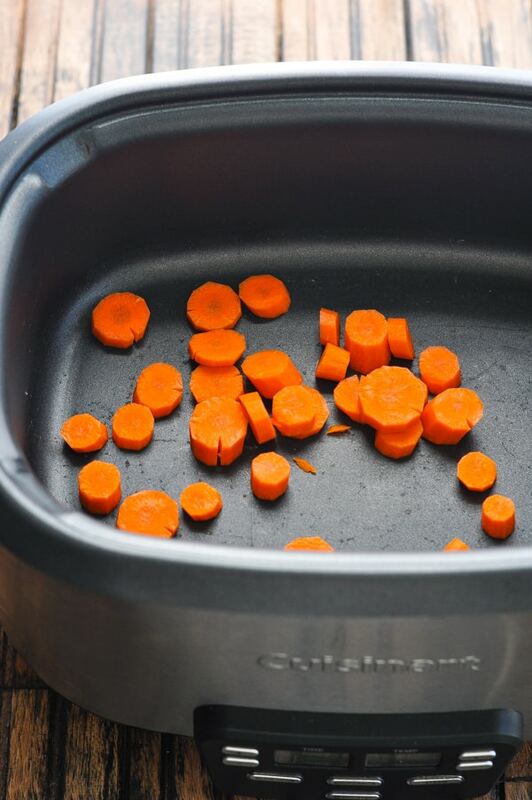 Place carrots in bottom of slow cooker. 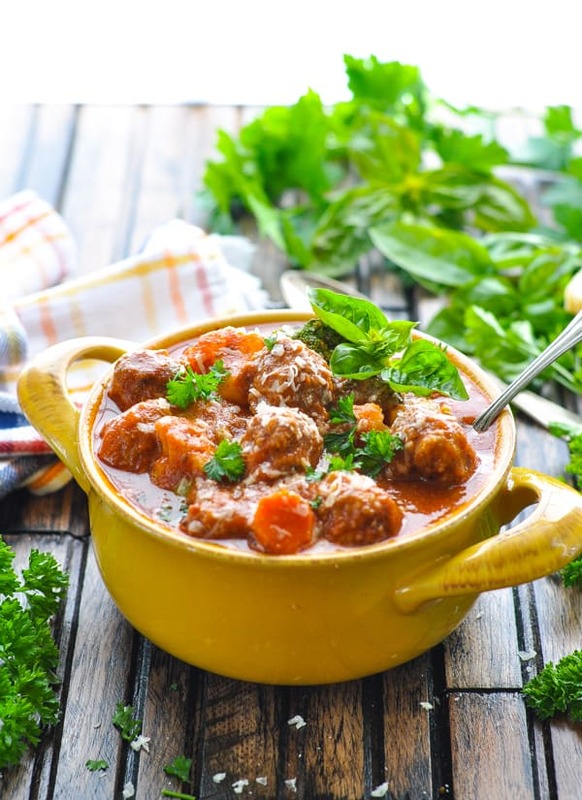 In a large bowl, use hands or a fork to gently combine meatball ingredients. 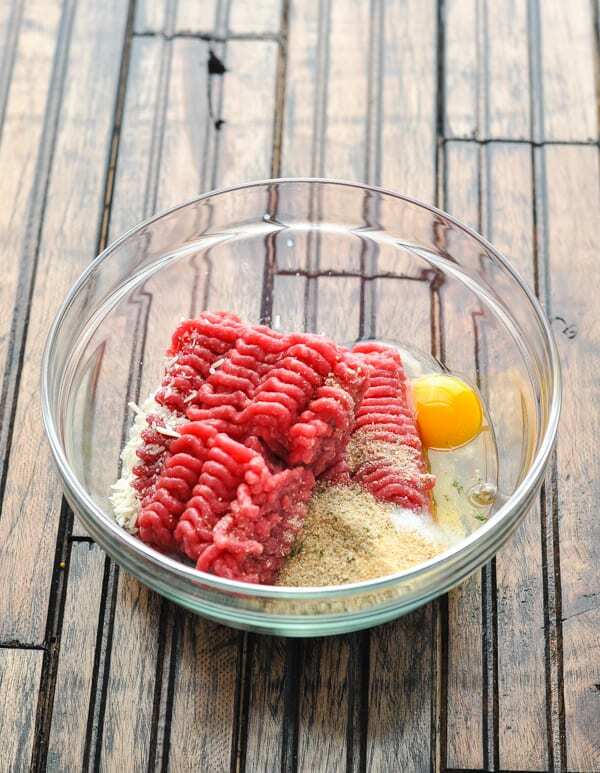 Form meat mixture into 1-inch balls. 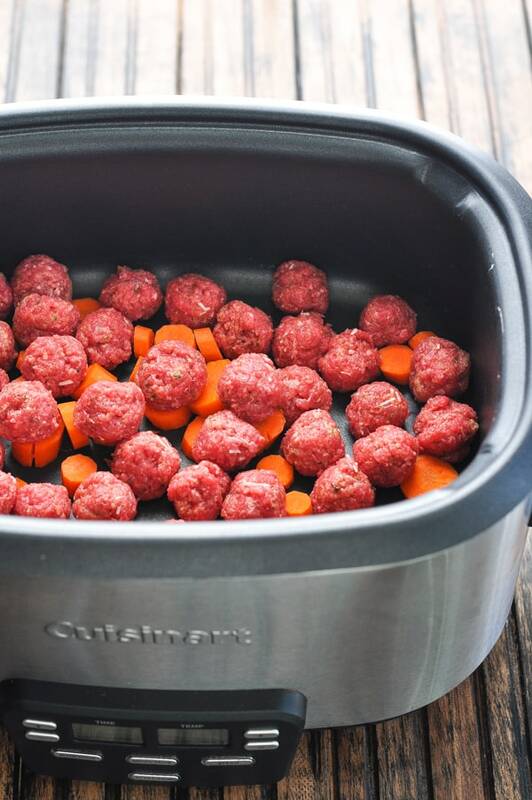 Place meatballs on top of carrots in the slow cooker. 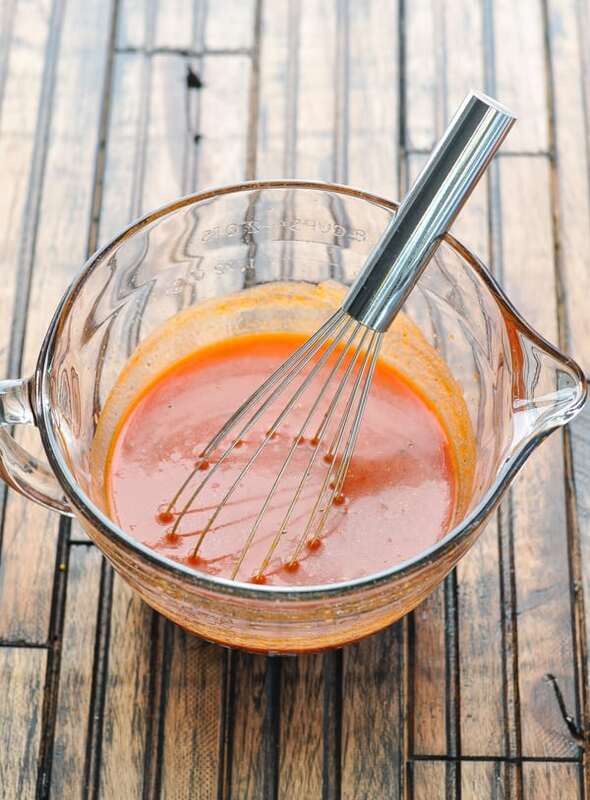 In a separate bowl, combine tomato paste, broth, marinara, seasoned salt, oregano, and basil. Pour over meatballs. Cover and cook on LOW for about 4 hours or on HIGH for about 2 hours. For a thinner soup rather than a stew, add extra broth until it reaches desired consistency. 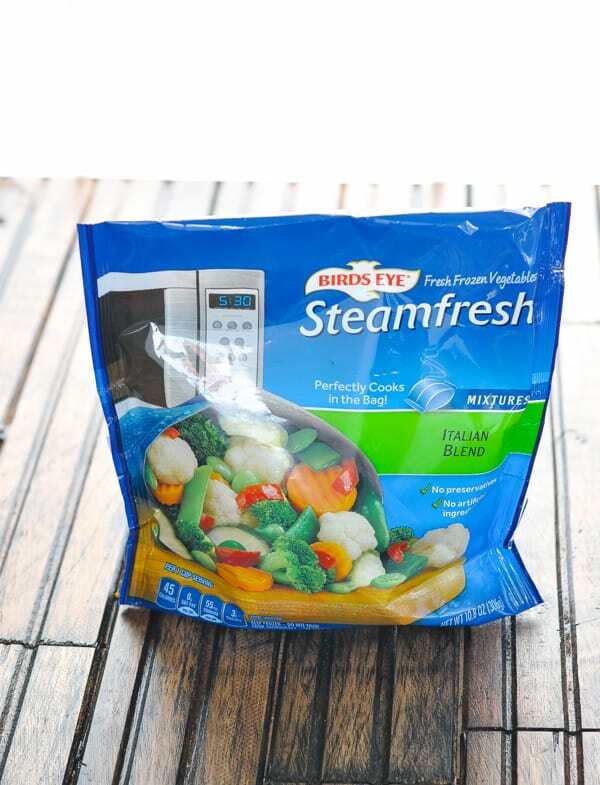 Steam vegetables in microwave just until crisp-tender (about 3-4 minutes). Stir vegetables into stew and serve over pasta or rice, if desired. Garnish with fresh parsley or fresh basil. This recipe yields 6 cups of stew, which serves 3-4 people. If you're feeding a larger family, I recommend doubling all of the ingredients. The cooking instructions remain the same. You can substitute ground turkey or ground chicken in place of the beef. Just make sure that whatever meat you use is at least 96% lean, since you will not be draining the meat after it's cooked. You don't want any extra grease in your stew. This is a thick stew with minimal broth. If you want a thinner consistency so that it's more like a soup, just add extra beef broth at the end. I serve my kids' stew over pasta or rice, which they love. This recipe was originally published in October, 2014. It was updated in December, 2018. The meatball stew looks so good. Perfect for my son and husband. Pinned and put it on the menu for next week! That’s great — enjoy, Ann Marie! Blair, this looks delicious! 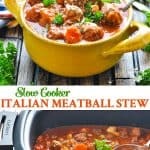 What a comforting meal, and it’s made in the slow cooker! Pinned and I can’t wait to try it! Yum! This looks perfect for these cool Fall evenings! Thank you so much for linking up at Tasty Tuesday! Your recipe has been pinned to the Tasty Tuesday Pinterest board! Please join us again this week! Thanks for visiting, Stephanie, and thank you for the pin too! That’s what I call “comfort in a bowl”! Thanks for the recipe. Thanks so much for sharing on Show Me Saturdays! Oh my thank you for this – I have been wanting to add some slow cooker recipes to my collection and was running out of ideas! Oh my goodness! 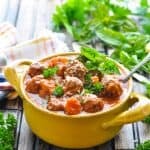 These meatballs look great..so good and hearty! How delicious, what a hearty meal to warm your stomach on cold night. This has been featured as one of my favourites over at Sweet and Savoury Sunday. Stop by, grab a button and link up again with us this week. Have a great day! Oooo yes please. I’m clicking over there to read and pin right now. It sounds yummy and right up my street.